Clove oil is mainly composed of caryophyllene, eugenol, iso-eugenol and eugenol acetate. Clove is the native plant of Malacca Islands and Indonesia. It is an evergreen tree that has bright green leaves and nail-shaped rose-peach flower buds. It grows about 10 meters (30 feet) tall. After drying the fruit turns deep red brown and beaten from the tree. The word 'clove' is derived from latin word 'Clavus' which means nail shaped, referring to the bud. The clove oil is used by Chinese, Greeks and Romans, as breath sweetener and for toothache. It is also helpful in the prevention of contagious diseases like plaque. Cloves were among the most valuable commodity in 16th and 17th centuries and is considered as valuable as gold in Europe. It is a important in spice trade and is used in perfumes, mulled wines and liqueurs, love potions and dental products. It is stuck in an orange as pomade and works as an insect repellant. The clove oil is pale yellow or colorless liquid with medium to watery consistency and has spicy, medium to strong warm aroma. Clove is used for getting quick relief from respiratory problems such as tuberculosis, bronchitis and asthma. It keeps infection away and can be used for cuts, acne, burns and bruises. The oil is very much helpful in getting relief from arthritis, toothache, rheumatism, bad breath and mouth sores. It is also beneficial for the digestive system and works well against parasites, spasms, vomiting, flatulence and diarrhea. The disinfecting property of clove oil is helpful in case of infectious diseases. Its fragrance is useful in keeping the fish moths away from the cupboard. Clove oil is anti-infectious and rich in various minerals. It is very effective when used for curing various respiratory problems. Clove oil is highly recommended for skin problems, specially in acne. It is useful in the treatment of wounds, cuts, scabies, fungal infections and prickly heat. The clove oil is considered as analgesic, antiseptic, antispasmodic, anti-neuralgic and insecticide. Clove oil is considered as stimulant, it eases stress and lifts depression. Clove oil is Light Golden Yellow oil with a warm, strong and spicy strength of aroma. Sandalwood, rosemary, basil, lavender, peppermint, cinnamon, benzoin, grapefruit, citronella, ginger, orange, lemon, rose, clary sage and other spice based oils. 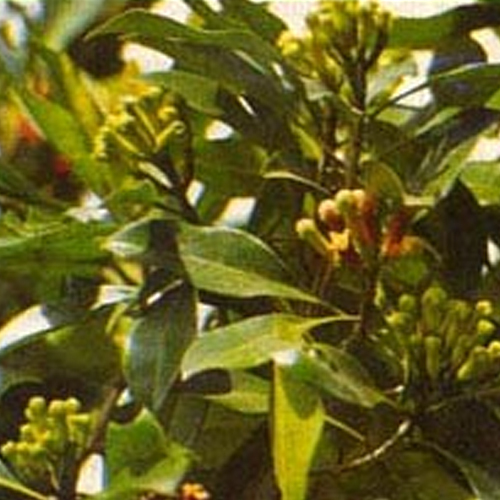 Clove Bud essential oil can cause sensitization in some cases and should be used in dilution. It is to be avoided during pregnancy. These products are delivered as with the help of reputed shipping partners like DHL, Fedex, UPS, TNT, EMS.